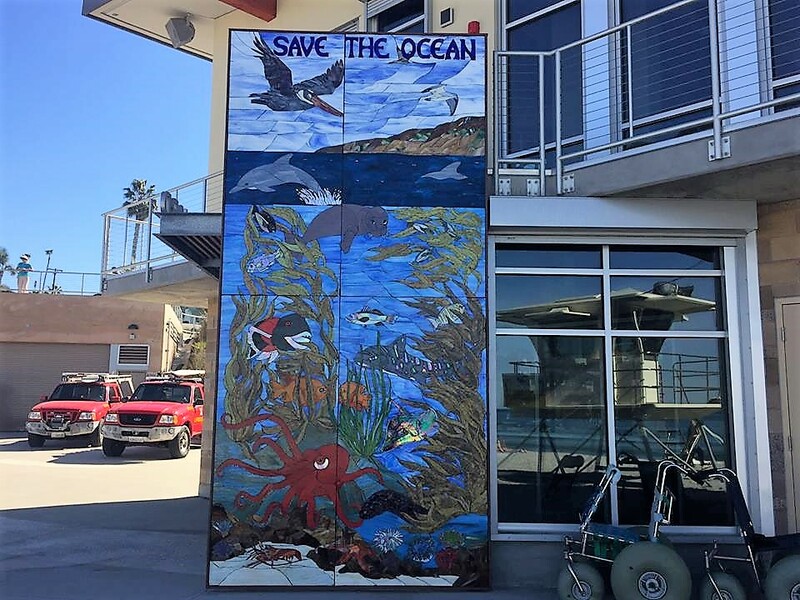 ENCINITAS — The Surfing Madonna Oceans Project has installed a highly anticipated mosaic at the city’s new lifeguard tower at Moonlight Beach. The 7 1/2 foot-by-15-foot mural entitled “The Pacific Playground” — which hundreds of residents helped put together — was placed on a wall near the entrance to the $3.7 million lifeguard tower and safety complex earlier this week. “It’s a dream come true, very rewarding,” said Bob Nichols, Surfing Madonna president. “It has been a lot of hard work and a lot of time, but, you know, it is something that our organization has worked very diligently on. “This community needs more art, and as a save-the-ocean organization, we wanted to put out that message through art and show just how beautiful our local ecosystem is, and at the same time, show how fragile it is, and this is a great way of showing it,” Nichols said. The artwork, originally drawn by artist Peggy Sue Zepeda, cost the nonprofit about $30,000. Originally, the nonprofit was going to donate the art to the city, but in October, the City Council approved a change to the arrangement that calls for the nonprofit to loan the piece to the city for five years, followed by two, five-year lease extensions if both parties agree. The mural was constructed by Don Myers and Manny Corona with the help of many community artists at Meyer’s stained-glass shop in Oceanside. Nichols said that hundreds of people helped put the pieces of stained glass in place. “Even more rewarding than seeing it up is to see how people are responding to it,” said Brad Hanson, a board member on the nonprofit. The lifeguard tower, which was supposed to open this winter, is in its final stages of completion, though there is no date scheduled for the grand opening, city officials said.